In my day, the movie Short Circuit lead to a mix of kids running round yelling "Number Five alive", and parents reminding said screamers that the bulky robot was "merely fictional". 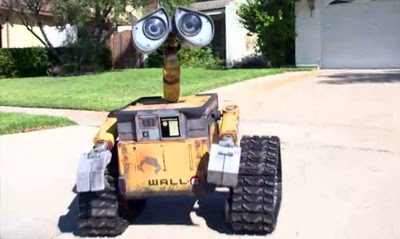 Fast forward more years then I care to count, and Number Five has been replaced in the cute robot stakes by the animated hit-maker WALL-E - and instead of remaining a fictional character, one fan has literally brought him to life. The appeal has to be in the puppy-like eyes doesn't it? I'm sure even if Mike's next project is a fully functioning Ultron, as long as he has those eyes, people will still go 'awwww' before he makes his dastardly move! Thanks for stopping by Brenda, glad you liked what you found!